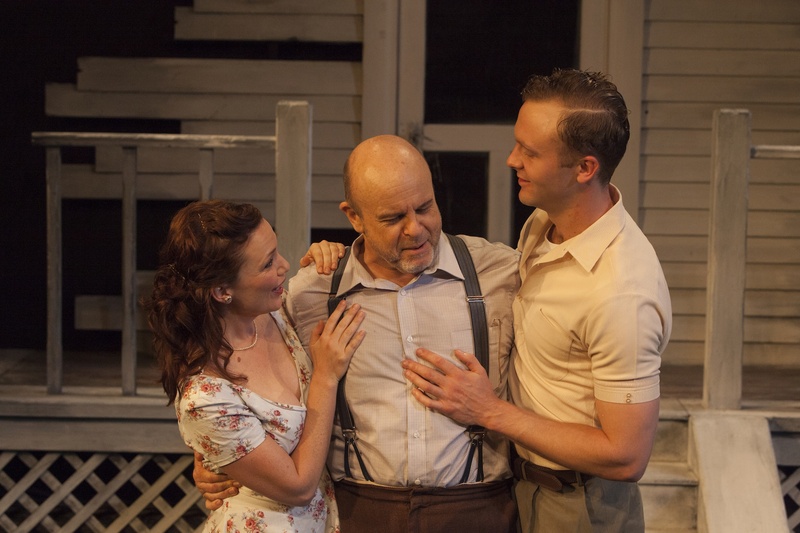 Darlinghurst Theatre Company has christened the new Eternity Playhouse with Arthur Miller’s first commercially successful play, the gut-wrenching All My Sons from 1947 – and both the venue and the production have come up trumps. The sensitive conversion of the newly restored Baptist Tabernacle, a 126-year old, heritage-listed building in Burton Street, Darlinghurst features a spacious timber foyer and a beautifully appointed 200-seat theatre with excellent sight lines and acoustics. It all feels fresh and welcoming, while original features such as the ornate ceiling and stained glass windows add to the venue’s charm. Miller’s tightly plotted play resonates powerfully in the intimate space. Set in the aftermath of World War II, Joe Keller (Marshall Napier) and his wife Kate (Toni Scanlan) are living a life of suffocating denial. Convicted for knowingly supplying faulty aircraft engine parts from his factory, which caused the death of 21 pilots during the war, Joe was subsequently exonerated leaving his business partner Steve to take the rap. Kate, meanwhile, clings to hope that her son Larry, a fighter pilot, is still alive despite having been missing for three years. A sense of tragedy hangs over the play from the beginning, as Joe and Kate’s other son Chris (Andrew Henry) invites Larry’s former sweetheart Anne (Meredith Penman) to stay, hoping to marry her. Anne, who grew up next door, is Steve’s daughter. When Anne’s brother George (Anthony Gooley) arrives, having just visited their father in jail, dark secrets are revealed leaving no possibility of a happy outcome for any of them. Unlike many of the auteur, re-imagined productions of classics that we have seen in Sydney of late, Iain Sinclair directs a traditional production set in the period and using American accents, but it is fluent, well paced and beautifully performed, unfolding with the inexorable undertow of Greek tragedy. Scanlan breaks your heart as the desperate, deluded, at times feverish Kate who dares not admit the possibility that her son is dead, while Napier convincingly conveys the gruff bonhomie covering a dark, gnawing secret. Henry excels as the open-hearted Chris who longs to step out of Larry’s blighted shadow and live his own life, while Gooley ramps up the energy with a bristling anger as George. On opening night, Penman brought a sparkling warmth to the role of Anne, but due to a major television opportunity has since been replaced by Anna Houston. In the supporting roles, Sinclair (who plays a doctor as well as directing), Mary Rachel Brown, Briallen Clarke and Robin Goldworthy all acquit themselves admirably. Luke Ede’s set works well enough and is subtly lit by Nicholas Rayment. Occasionally Nate Edmondson’s music feels a little too overtly manipulative emotionally as in a film score, particularly in the climactic scenes when it is distracting and unnecessary, but that’s a minor quibble. Performed with an intense honesty, Miller’s timeless story about the link between commerce and war, and self-interest in the name of the family, still rings devastatingly true in this stirring production.